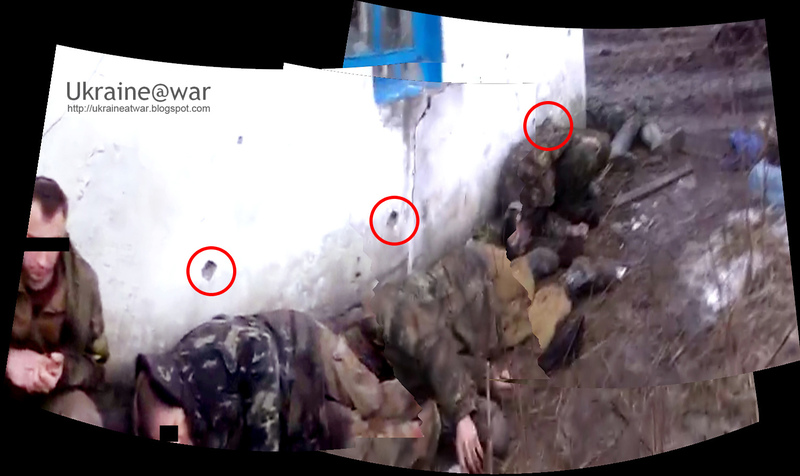 3 videos appeared with the same (dead) Ukrainian soldiers. It is within the region that has recently been taken from Ukraine (totally against the Minsk agreements!!!). 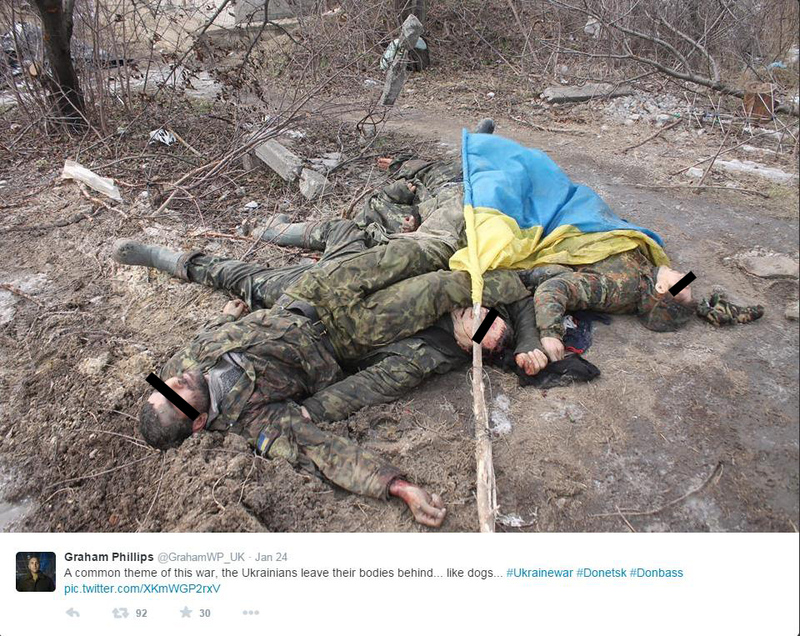 They can be identified as the same by the boots, pants, bearded face and (blood on) face for instance (yellow circles). Number #13 has later been identified as Lieutenant Kolesnik, the commander of the group who did not want to surrender and died fighting. See this article. 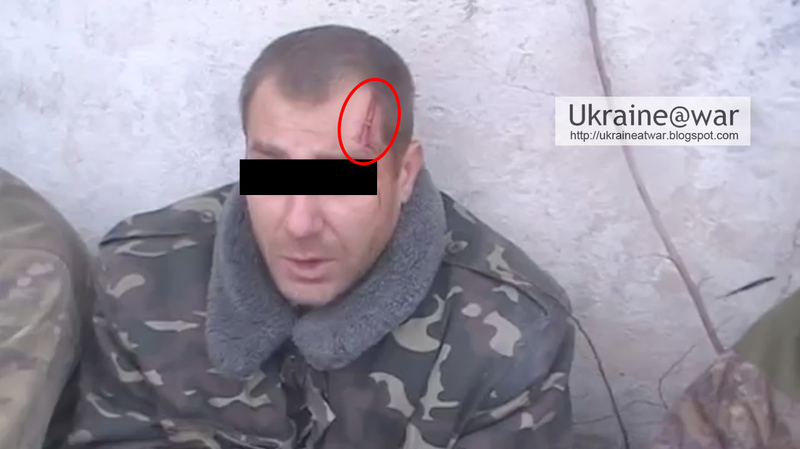 Most of the blood on this mans face comes out of his right eye goes along the edge of his hood and also OVER the edge and OVER his hood downwards. Also the smaller blood stripes run from the bottom right of his face to the top left, as indicated by the arrows in the screenshot. This means that this blood ran over his face in exactly the position he is lying right now. So he got the injury RIGHT BEFORE he fell down like this and then the blood started flowing. It means that he DIED RIGHT THERE. He did not die in battle and than they dragged his body to this location. He died HERE. This video by Thomas Steiner also graphically displays what has happened. At 2:40 in video #1 we can see POW #9 still moving, meaning that at THAT moment he was still alive. Later he can be seen among the 4 dead soldier and he can be recognized by his pants. It means he was bleeding to death ON THIS SPOT and there is a bullet hole behind him on the wall. The imprint on his head is too regular to be a normal scratch. It is clearly an imprint of an object. The Ukrainian checkpoint south of Krasnyi Partizan has surrendered to the invaders with 12 soldiers getting captured and their commander becoming KIA. They had been put sitting against the wall of the house they used to shelter. Five of them have been shot with three of them getting killed on the spot. One of the soldiers involved with this crime filmed the scene after the shooting WHILE one of later dead people was still alive. They threw the dead bodies on top of each other near the road, for a car to pick them up. The soldier filmed those again as some kind of 'trophy' of whom they had killed. 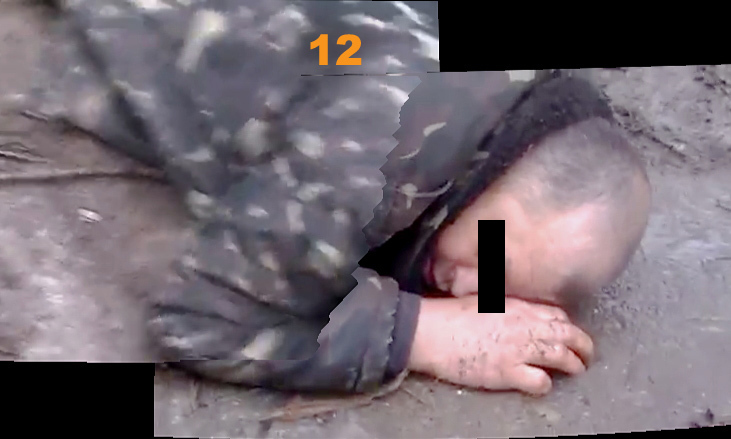 Video #3 was filmed to show on Russian tv how they had successfully attacked and conquered a Ukrainian checkpost killing Ukrainian soldiers in the process. What happened to the wounded and still living POWs is unclear. Sometimes they kill some to have to others obey them without problems. They may use them to work for them digging graves and trenches as has been the case before. They may also have been taken somewhere else to get killed. You see what they do? WHO put those bodies there 'like dogs'? That was done by Graham's friends! Remember that Zakharchenko said: "We'll take no prisoners"
This video is from Al Jazeera and gives a high quality impression from the location. We can see a fragment of the POW-movie (#!) there. It means 'Dedouka' had filmed that video. If anybody has more information on him, please let me know. In this video a priest can be seen taking the bodies sway on a truck. This is the pastors facebook page. He is a hero, because he went to the Russians unarmed and asked if he could take the bodies with him. This is the commanders ok.ru profile. 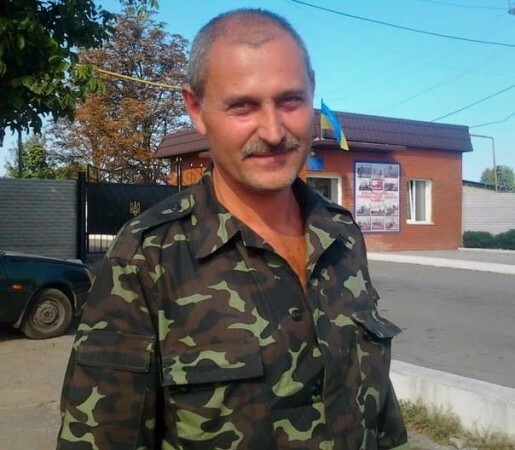 His real name: Юрий Проценко/Yuri Protsenko, born in 1963, Konstantinovka, lives in Druzhkovka. An archived interview with him at Saur Mogila, where he says he had been fighting in Afghanistan. What the Ukrainian people deserve such punishment? I ask you all not to remain indifferent and save my country from the Russian occupation and Russian gangs. RIP Ukrainian heroes who lost their lives against cruel enemy. This crime will never be forgotten and for sure criminals be punished. The Ukrainian mass medias should show this investigation every day in order to ordinary people understand whom they are dealing with.